Thank you to everyone who completed my recent survey. It was opened for comment on 13 April 2014 and there were 53 responses between that date and 1 May. It will take more than one page to do justice to the many thoughtful and interesting responses. This page is a kind of intro: information about who answered the survey and the reasons people gave for visiting this website. The graphs can be enlarged. The majority (65.38%) of responses came from people resident in York (within City of York council boundaries, includes some villages outside of York). 25% were former residents (many of the people on my mailing list are former residents). The remaining 9.62% were people who regularly visit the city. 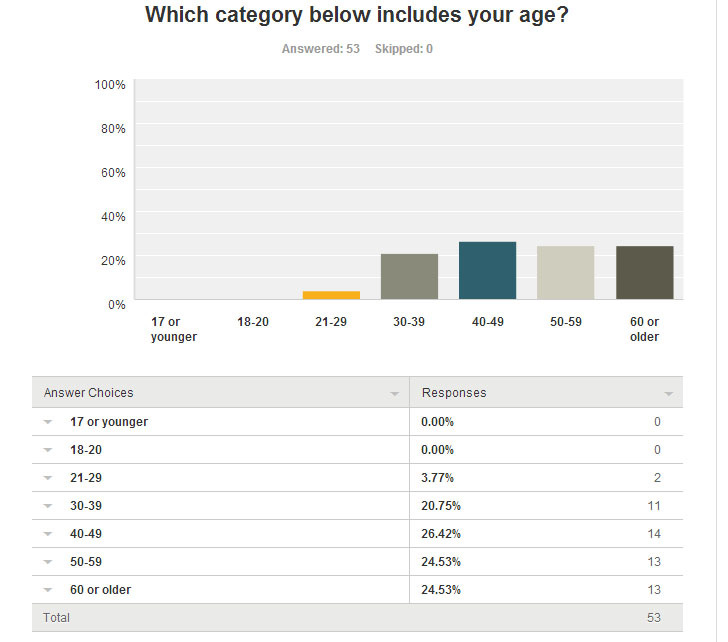 Most of the people who completed the survey were in the over 30 age group. Only 3.77% were under 30. The highest percentage (26.42%) were in my own (40-49) age group, closely followed by 24.53% in the 50-59 age range and also 24.53% in the ’60 or older’. (I didn’t particularly like that rather broad category but it was one of the standard formats the survey offered.) 20.75% of respondents were in the 30-39 age group. I’m not going to attempt analysis of this, just want to say that of course there are people in the under-20 age group visiting the site (the graph above shows none) but perhaps they’re less likely to fill in online surveys. 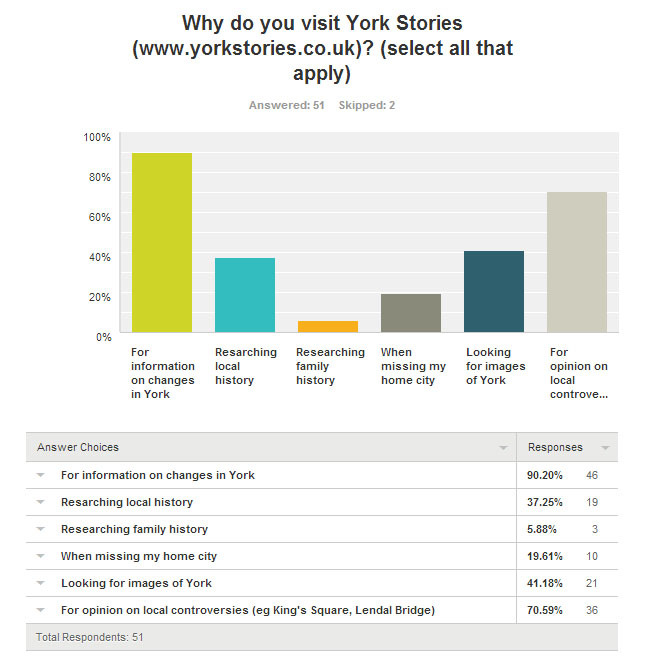 90.20% of respondents visit for information on changes in York – not surprising, as the subtitle of this website is ‘York and its changes from a resident’s perspective’. There was an ‘other’ option on this question too, but it can’t be turned into a graph as it was a text box for comment. Some of the comments from this and a later similar question on the survey are on a separate page, where I collected them together as they were so good to read and made the ten years of online work seem worthwhile. Thank you. I appreciated your considered thoughts and your kind words. The first two responses were from people who had seen the survey posted on the website before it was mentioned anywhere else. I then advertised its existence on Twitter, and this brought more responses fairly rapidly. A newsletter mailing to my mailing list resulted in many more. I mentioned it on Twitter several times after that. It wasn’t advertised on Facebook – at least I didn’t advertise it there as I don’t use Facebook. Two people whose views I was interested in I contacted individually, one responded. The number of responses stuck at 49 for a while, so I mentioned it again on Twitter in the hope of getting to a nice round 50, and in the end had 53. The response to the ‘Name’ box was interesting. I didn’t make it compulsory, because I know that ‘anon’ can often speak the truth and that being ‘anon’ isn’t necessarily a bad thing. Though it was noticeable that the majority of responses did include a full name. 38 of the 53 responses included a full name, or Twitter name, or online identity I’d recognise (eg distinctive first name which was recognisable to me from comments on the site/email/Twitter correspondence). Of the other respondents, the ‘anons': 8 left a first name, 1 respondent included a first name and place (‘from Poland’), 1 left initials, 1 apologised and said he/she never gave a name on online surveys, and 4 people left the box blank. So, that’s the context and some info on who responded. What did people say? There were definite trends/repeated concerns, and some interesting observations. More soon. Sorry Lisa, forgot to do your survey – will do next time! Be interesting to see the results.